What comes first. lyrics or music? That’s probably the most common question I am asked when I conduct workshops and seminars. My answer is that the more variety that a songwriter can add to starting a song, the better. I try to start each song that I write from a different point of view as my starting point. 1. Writing a full lyric first and then putting it to music. 2. Writing a full track without melody first. 3. Writing a full track of music with melody but no lyrics. 4. Writing based on a song title. 6. Writing based on a beat or drum loop. 7. Writing using a musical instrument that is not your primary instrument of writing. If you are a keyboard player try a guitar, or vice versa. All of these are valid and commonly used, or of course a combination of any. My latest writing technique has been to try to write a complete lyric draft first without even thinking about music. Apple Loops has revolutionized my song writing. Once I have a draft of a lyric, I’ll explore a bunch of possibilities in Apple Loops and choose a groove, usually a guitar lick that works for the first line of my lyric. The rest of the song usually unfolds like a jigsaw puzzle from that point on. In order to write a lyric first, we need to have a starting point for that. Many of my song writing friends and peers always carry a notebook with them during the day and keep one close when they are sleeping. A particular person encountered during the day, a sign on the street, a line from a newspaper or from something on TV is usually a catalyst for a word or line or visual image that can be noted and used at a later point. Many producer/musician/songwriters work this way. 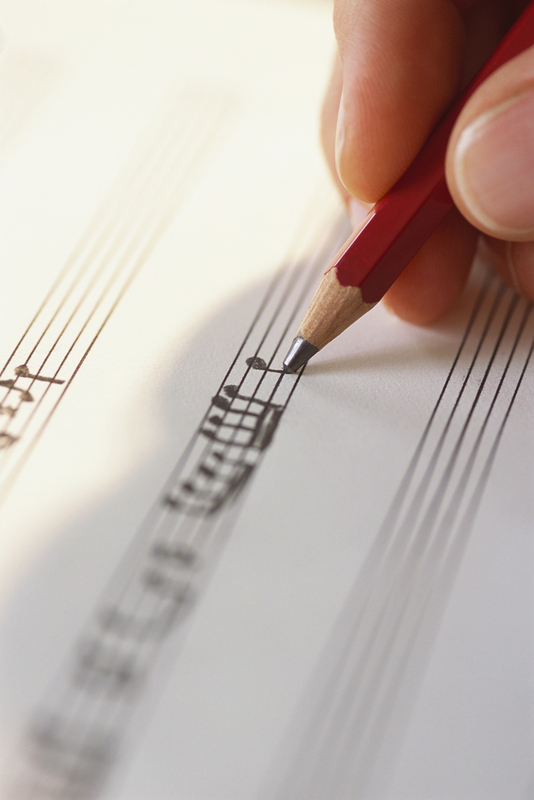 If you have skills as a musician producer, many lyricist/melodists enjoy writing to tracks. The majority of my song covers were written using this method. When I have produced a track to submit to a lyricist/melodist, it is produced in a specific manner that I have found works very well. In my case I try to make my tracks either very contemporary sounding or sometimes, in the case of a ballad, as timeless as possible. The most important thing to do with tracks, is not to turn them into instrumental songs. They must leave space for the lyricist/melodist to add their part. Often an event can happen in ones life or in the world that can inspire a song or story. Sometimes a persons name will do. When writing to a title, I often suggest to my students that they write a short prose story based on that title. That story then forms a data base of information that will feed the resulting song. A much utilized song writing exercise used by a number of teachers is to write a prose story first. A common approach is to write a story based on a first love. In writing prose stories, we try to add as much detail as possible to give our own unique take to the story. I have found this to be a great starting point for songs. It is something like writing a small play or movies. in fact I believe songs are very similar to little plays or movies. In hip hop and rap, beats predominate. Again a simple starting point would be to go through the volumes of beats that are available and jam some words along with the beats. i find that it doesn’t matter at first if the words make sense or not. Ultimately as a a result of constant repetition a line will come through that makes sense and defines the meaning of the beat. A song lyric can then unfold based on a starting line. I am a good keyboard player. On guitar, I know three chords. However some years ago I produced and wrote an entire rock album written exclusively with my limited knowledge of guitar. This created a simplicity and rock feel that I could never have achieved had I used my normal writing instrument. Song writing collaboration is a great way to extend ones vocabulary in writing songs. That vocabulary can be extended with different genre’s, styles age differences, geographical location and different specialization and skills.